In case you missed it, I wrote my first and only guest post for What I Learned Today last week, On Writing and Blogging. Over the past seven months or so, I’ve learned much about the business of writing. Fascinating stuff. More fascinating still is the craft of writing. I’ve never doubted that it is an art form, I just never understood the importance of the rules. Rules that are allowed to be broken, but only if you know what they are in the first place. Clearly, I break the rules without even knowing it. Sometimes I stumble upon writing a decent story, but I think it is exceedingly rare to find a writer with any staying power who is just winging it. One of the cardinal rules of writing is that a writer must read. Even reading bad writing has its merits, because it reminds us of what not to do. Ah, but good writing? Good writing inspires us and nourishes our souls. It challenges us to be better writers. Or at the very least, a more appreciative audience. If you are an aspiring writer (and seriously – who isn’t these days?) 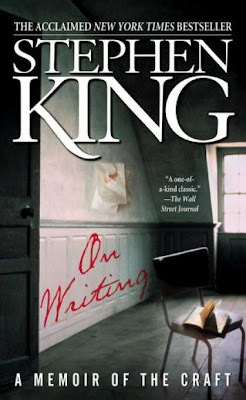 I would highly recommend On Writing by Stephen King. It is the best book about the craft of writing I’ve ever read. (Note: It is also the only book about the craft of writing I’ve ever read.) This is my blog, and I want to sound as if I know what I’m talking about. Please play along. Which only reiterates the point of my guest post for Billy Coffey. I am a blogger who writes. Some day I may venture out into deeper waters, but for now I think I’ll just keep to the shallow end with only the occasional swim out to the deep. Stay tuned. >Another blogger who is an accidental writer on occasion… And sometimes only an occasional blogger! I love it all. But it is a treat to read a true writer's words. >On Writing is one of my favorite books about the craft. I read it years ago and I can still feel King's ear pain and cringe when I think of the girl sitting on him. Honesty, raw honesty in writing is beyond refreshing. My car could use a good cleaning before winter…. >I was told that I should read that book several months ago… guess it's time to actually do it! >You should write the official HLAC book! >Peter – "The Official Handbook about Nothing in particular"? >Lots of wisdom in those words. >Okay, okay! I'm trying to get serious already! Sheesh. Why is everyone so pushy? Love "On Writing" … its the book that really motivated me the past year or two as I plug away at my story.